The orbits of the large planets are very well known and their position may be precisely predicted for the planning of complex swing by maneuvers of interplanetary space probes. There are exact analytical solutions for this two body problem of the Sun and the large planet. 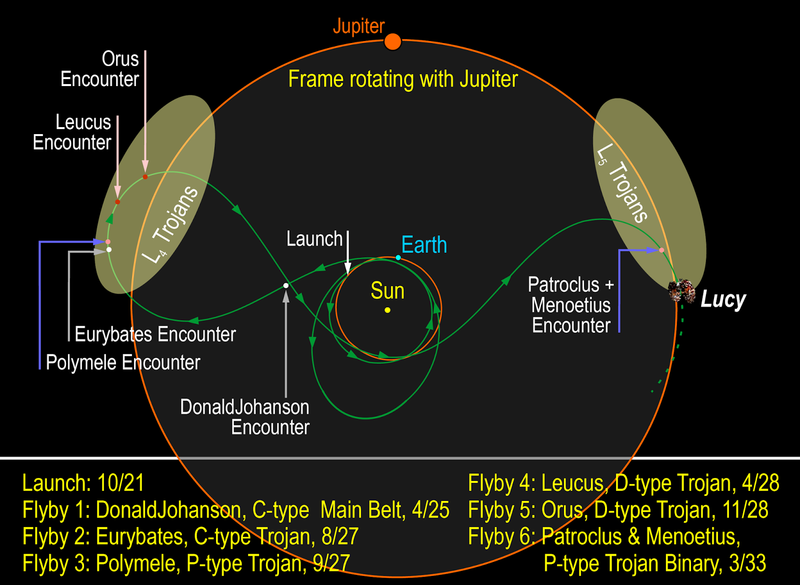 But the orbit of a Jupiter Trojan is a three body problem. The orbit of the asteroids near the Lagrange points L4 and L5 are known to be stable but they do not maintain a fixed separation to Jupiter. The period of liberation is about 150 years. But most of the known Trojan are observed for less than two to three decades. Planning of the very complex trajectory of Lucy needs to know the precise positions of the visited asteroids up to 10 years in advance. A close flyby is important to get a chance for images with good resolution showing many details. In this answer to the question How to calculate the planets and moons beyond Newtons's gravitational force? 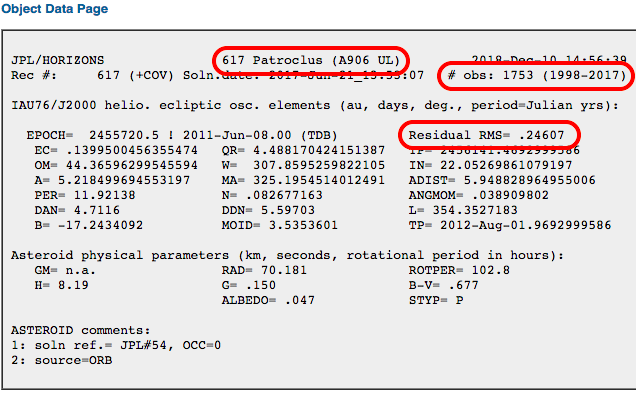 I show that you can calculate the Sun, the Moon, the planets and several asteroids to one kilometer over one year, with respect to the best JPL simulation (the ephemerides used to plan space missions) with just a little Python script. Of course you can see the deviation is exponential, but I didn't really try that hard. There is nothing scary or difficult about the n-body problem, even though KSP makes it sound that way. There are some limitations, but you don't need to really calculate $n(n-1)$ because most are too weak to worry about. If you have 10,000 asteroids, most of them have extremely tiny effects on anything besides themselves. indicating the attention to the gravitational effects due to the smaller bodies, which might or might not have well defined orbits and masses, but need to be taken into account even if in an approximating way. Uncertainties in the non-gravitational forces (e.g. outgassing, solar pressure, radiation) Read about the Marsden parameterization (for example) in Did Rosetta improve on models of non-gravitational effects on comet 67P's orbit? These are all about the same for an asteroid that's in a Lagrange point-associated orbit and one that's in a simpler heliocentric orbit, for the simple reason that there are no orbits, there is no spoon. Everybody is pulling on everybody all the time. Let's look at the six flyby's to see seven bodies. I looked in JPL's Horizions and did a quick check of their state vectors. In the output is a summary of the solution you are viewing for each body Examples are below. Here's a table of these bodies. You can see that they are all very old friends, having been measured for decades, with 500 to 1,500 individual observations of each having been used in the fitting to determine their orbits. Each one has made nearly two complete orbits around the sun if not more during this time. That is quite a hefty bit of arc! Residuals are a fraction of an arcsecond. At 5 AU, one arcsecond is 3,600 km and the RMS is not necessarily the uncertainty in the orbit, it's mostly a measure of the jitter in all the individual optical observations. 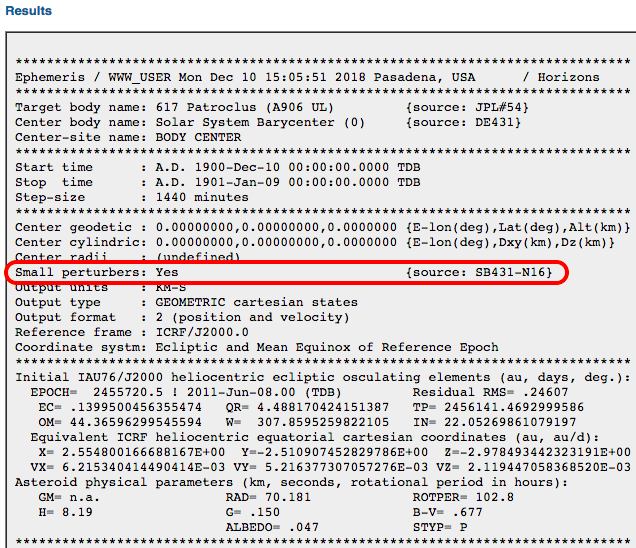 However here the RMS residual is only a quarter of an arcsec, or roughly 1,000 km, much closer than the flyby distance! You can be sure when they launch Lucy, they will be checking these asteroids with renewed vigor, and may be doing so already! Not the answer you're looking for? Browse other questions tagged orbital-mechanics nasa planning lucy-asteroid-mission or ask your own question. How do geosynchronous orbits follow the tilt of the earth?